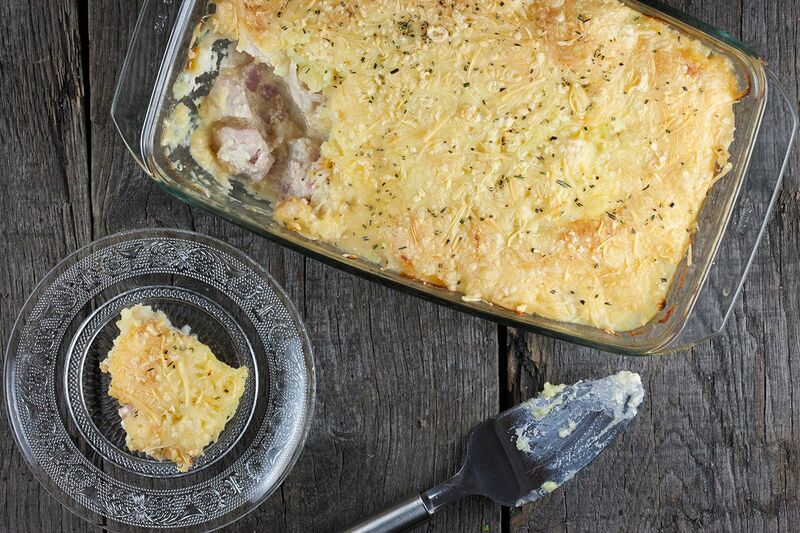 A creamy chicken casserole is easy and DE-LI-CI-OUS! Chicken, bacon, garlic, celery and potatoes, what's not to love? Ready in 45 minutes. PEEL the potatoes and celery root, rinse them well and chop into pieces. PLACE them into a medium-sized pan, fill the pan with water and salt and bring to a boil. Meanwhile PEEL the red onion and garlic cloves. Finely CHOP the garlic and slice the red onion into half rings. CHOP the chicken into bite-size pieces and PRE-HEAT the oven to 190 degrees celsius or 375 degrees fahrenheit. HEAT butter in the large skillet and add the bacon lardons. Then after about a minute, also ADD the garlic and red onion and saute them a few minutes more. 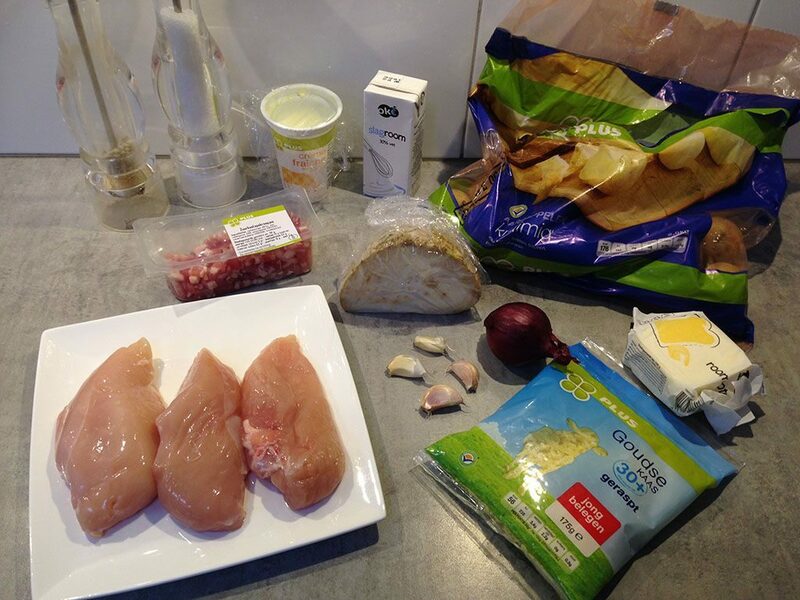 ADD the chicken pieces and shortly cook them, they don’t need to be fully cooked. Turn off the heat and stir in the creme fraiche and a dash of cream. SEASON with pepper and salt and DIVIDE the mixture in the oven dish. As soon as the potato and celery root is fully cooked you can DRAIN them using the colander. Now create a smooth puree by using a fine sieve and a ladle or a potato masher. SEASON the puree with pepper and salt and divide over the oven dish. FINISH it off by adding a layer of grated cheese on top. 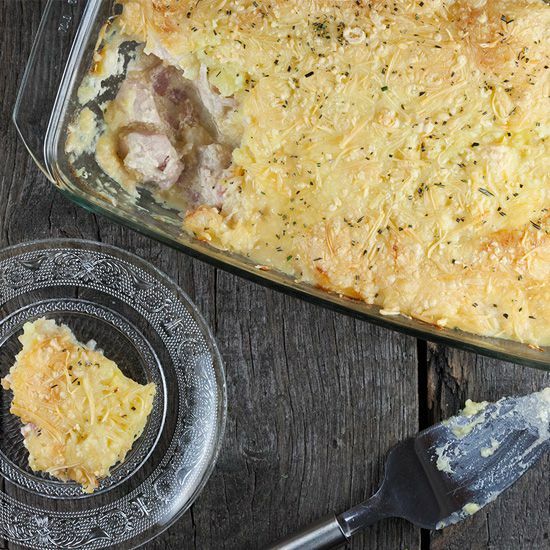 BAKE the casserole in the oven for about 25 minutes, or until the cheese is beautiful golden brown. SERVE with a green salad if you like. Enjoy! This was wonderful. I made it for dinner last night. Lovely flavors. I did add dried parsley and dried sage, because they are so good with chicken. Delicious! Hi Vanessa, so glad it was a delicious meal! The dried parsley and sage are a great addition to this dish.